3 Gallon BIB that connects to a juice gun system. Any flavor on your juice system can be thickened to nectar / honey consistancy. This is the easiest, economical and precise way to thicken your products. AquaCareH2O gives a Better Quality of Life for people with Dysphagia. AquaCareH2O looks, tastes and can be utilized like water. We add no masking agents so the individual can taste the water; they may drink more, resulting in better hydration. With the low inclusion rate of xanthan and no cornstarch, there is less chance of constipation. With better hydration you will have fewer bed turnovers, which equates to lower costs for the nursing home. Better hydration allows rehab patients to possibly go home sooner. It also ensures better skin integrity and can help reduce bedsores. Unlike starch based products, AquaCareH2O has no calories and helps in diet control for residents who are diabetic or on a low calorie diet. AquaCareH2O has zero lemon flavor and no bitterness from cornstarch. AquaCareH2O is not broken down by amylase in the saliva. AquaCareH2O is clear and not cloudy - making it visually more appetizing. With AquaCareH2O the resident will drink more; this leads to less waste, less cost and a better health care choice. AquaCareH2O was four years in development. The plant is USDA and FDA inspected and is Kosher certified, Passover approved. Refrigerate after opening and use within 14 days. Many similar products have only a five-day shelf life once opened. Looks, smells, and Tastes like water. AquaCareH2O is made from Xanthan not corn starch. AquaCareH2O is made with Artesian Mineral water not tap water. You can mix AquaCareH2O with instant coffees, teas, hot cocoa or powder milk. Pureeing AquaCareH2O with vegetables, fruits or meats will give the resident more hydration and will not alter the taste of food. Mixing with other liquids may change the consistency. AquaCareH2O can be frozen. You can make ice cubes or frozen treats. Corn starch products will clump up after thawing out, but AquaCareH2O will not. AquaCareH2O can go from freezer to microwave without changing consistency. AquaCareH2O is ready to use. There is no mixing so you have a constant consistency with every serving no matter who serves it or when it is served. No mixing saves time. Many other products need to be shaken or remixed before using. AquaCareH2O does not settle or clump, it’s ready to serve. Bag in Box Thickened Water can be dispensed from your juice dispensing gun. 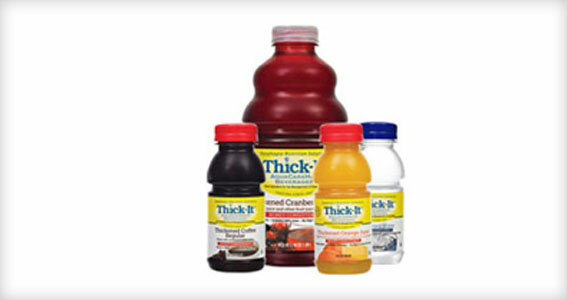 No need for additional thickened juice, since our thickened water will mix with the regular Bag in Box juice flavors. This process ensures consistency throughout your meal period.